The 36th Avenue. : Party Time and GIVEAWAY! Jennifer please email me your shipping info.
" I am here! Thank YOU Natalie for your sweet AWESOMENESS"
I am Natalie, the girl behind Johnny In A Dress! I am a Christian, Wife and Mother. My days are spent doing different therapies with my son, who has Cerebral Palsy, and picking up after my daughter, whose favorite activity at the moment is to to see how fast she can wreck our entire house. Over at Johnny In A Dress you will find crafty tutorials mixed in with glimpses of my day to day family life! I try to squeeze in a craft anytime I can, it's my comfort in this chaotic world. and I would love for you to stop by! ONE lucky winner would be able to choose any item from her new Shop. Johnny In A Dress The Shop. 1. Follow Johnny in a Dress come back and let me know. to Natalie on her blog or here and let me know. and let me know which is your favorite item there. Thank YOU so much Natalie and good luck everyone! So YOU thinh YOU can BLOG? So excited to share this week, thank you! I follow Johnny In a Dress at her blog! Whoo! I like Johnny In a Dress on Facebook! I visited Johnny In a Dress at her shop and I love the ruffled bags, and the ruffled scarves... and the button necklaces! Everything is so cute! I am a follower of Johnny in a Dress :) love her blog!!! I liked her on Facebook. Also I joined The 36th Avenue today and I liked you too on Facebook! I follow Johnny in a Dress's blog! I am a new follower of JIAD. Thanks. I follow Johnny in a Dress! I am a follower over at JIAD, too. Thanks for the giveaway. I'm a new follower of Natalies! I'm a fan of hers on fb! Following Johnny in a Dress on her blog! Like Johnny in a Dress on Facebook! Following Johnny in a Dress on Twitter! Left a comment about her darling lamp shade cover. I'm definitely trying that simple project. What a cool transformation!! Followed her on her blog!!! I LOVE ALL OF HER STUFF!!!! Both of you are such talented ladies!!!! I think I have become addicted! My fave item on her page... tough choice, but I really like the button necklace with the teal rosette. I also left a nice comment on her page. She's got some cool things. Looking forward to seeing more! Happy new follower of Johnny and totally in love with her ruffled scarf. I follow JIAD via GFC. I follow JIAD on FB! I follow JIAD on Twitter! 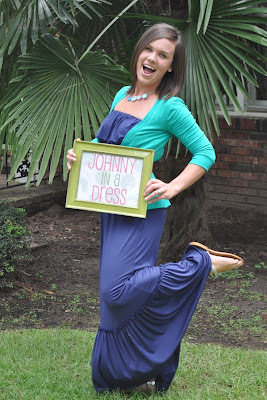 I follow the Johnny in a Dress blog via GFC. I like the ruffled bags and the window pane coat racks from the shop. Cute stuff. Oh, I like the button necklaces too! I left a comment on Natalie's blog! I LOVE Natalie's blog. Her ideas are so stinkin' cute! My favorite item is the blue coat rack-LOVE it! only just found you an hour ago - can't wait to check out more of your blog. i've linked up with something i worked on today. thanks for hosting this party - i love to check out all the wondeful and creative things peoples are doing in their spaces. I love her camera straps and necklaces. I'm Following and Liking JIAD - O YEAH !!!!! LOVE IT!! I'm Following JIAD - It ROCKS! I also left Natalie a sunshiny comment - why wouldn't I? I think she is and UNREAL chicky! I'm following Johnny on twitter! And pinterest! I am loving the button necklaces!! Left a comment over at JIAD! I love the window frame coat racks, the crayon rolls, the travel chalk cloth placemat..... and the list goes on! Left a comment at JIAD. I left JIAD a happy comment on her blog! I visited JIAD shop and love the Bloomin Ruffled Scarves. 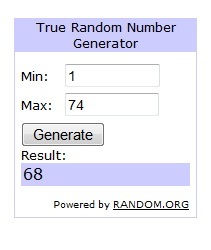 This GIVEAWAY IS CLOSED! Thank you everyone for your sweet comments! EXTRAORDINARY GUEST: Oh the Places You'll Go Map! Back to SCHOOL: Dry Erase Clip Board.